CONNECT RCS (Retail Communication System) is the next evolution of our market leading communications solution, CONNECT RCS was designed to seamlessly integrate with today’s modern IT infrastructure. The CONNECT RCS system allows you give true ownership of the call to your staff and reporting according allowing to easily track and manage workflow and tasks. Completely Web-Based configuration and management interface, accessible from any computer with network access. At its core is our revolutionary EMS (Event Management System) which allows for complete control of the entire event workflows. Built into the EMS is the DDS (Dynamic Decision Engine) which allows variable outcomes depending on specific events and current system state. Smart Devices now enable Paging Call confirmation of delivery and acceptance, as opposed to traditional one-way RF Paging solution. Smart Device integration allows for voice communication between attendants, managers and supervisors. Smart Watch is a true Wi-Fi Device, and as such is not required to be tethered to a secondary device. Scheduled task module allows for automatic generation and delivery of detailed reports. Multiple Push Button options for various conditions, Isle, Counter and external areas. With the Connect RCS (Retail Communication Systems) ‘live view’, managers and staff can see what’s happening on the shop floor at a glance. Problems can be anticipated and addressed before they even occur. Simple reporting options can also help you identify customer service superstars, high traffic areas and times of the day to assist you in better managing people and budgets. 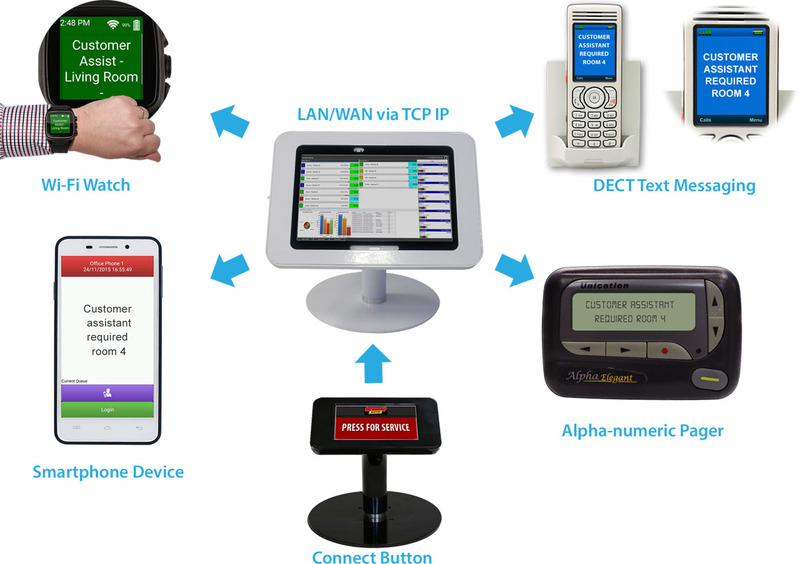 The Connect RCS can support a myriad of devices, from Pagers to DECT phones to Wi-Fi handsets and watches. The system can be customised to fit a small boutique fashion store all the way to a big box FMCG store. With versatile options this system can be customised to suit any budget, and what works best for your staff. Connect RCS allows you to enhance the customer’s experience and keep an eye on staff efficiencies, with an end result of more profitable businesses and happier customers. Thank you for contacting BluFi!